7:38 am - Tuesday - July 31st - Southwest Harbor, ME - 67º F, 88% humidity, wind 1 mph out of the south by southeast.......sunny with a forecast high of 77º F for this fine day. We continue to see the daily humidity levels decrease and are really enjoying having all our windows open again. Time goes by quickly and suddenly one day I realize we have not had to use any of our electric heaters in quite some time. 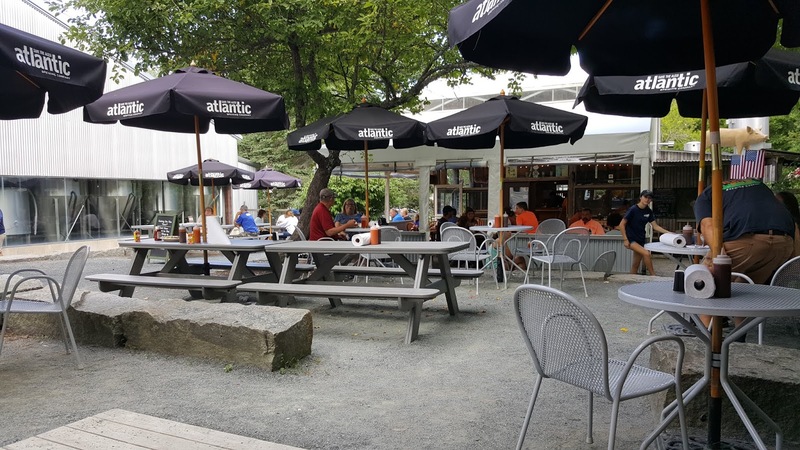 We have reached that time during the summer when, barring high humidity levels, our windows are open all the time, jackets are not being worn unless it rains, and shorts are always the order of the day. My work jeans are now being stored under the bed, all my gloves are back in their cubbyhole, and I haven't worn my SDC logo jacket in over a week. We are looking at two weeks of temps continuing to be in the 70's.....that will probably continue for another month and then we will begin to see the temps begin to dip back into the 60's once again, and then back into the 50's as we hit October. Our Monday was a typical Monday.....only 16 departures, but we had to retrieve 44 bundles of wood to replenish our woodbox......the most so far this summer! Tony and I helped Alex clean a few sites, but we quickly ran out of them as people, as they were on Sunday, were slow to pack up and leave. You would think they want to milk every single second out of their vacation.....hmmmm? We left Alex and turned to processing "returnables" and "recyclables"....what is the difference you might wonder? In Maine, as in many states, when you buy bottled water, soda, or beer you pay a deposit on each bottle/can. In Maine it is 5 cents per bottle/can. Most people don't save all their returnable bottles and cans and then return them to reclaim their deposit. For those who don't we provide several "returnables" locations throughout the campground.....4 to be exact. We collect these "returnables" in bulk and at some point in the near future we will load them in a large trailer, then deliver them to the local redemption center and collect the 5 cents per bottle/can. On the other hand many things are "recyclable" (certain plastics, glass, cardboard, aluminum, etc. ), but not "returnable" so we provide one main station near our office for those items. There are two problems with "recyclables" (emphasis on the quotation marks).......the majority of people have no idea what is and what is not "recyclable", and often what we find in this bin in about 70% trash. We don't have the time to sort through each 70 gallon bag to separate one from the other, so it becomes 'trash' 98% of the time. The dirty little secret about "recycling" is there really is NO recycling market for most glass and plastic. 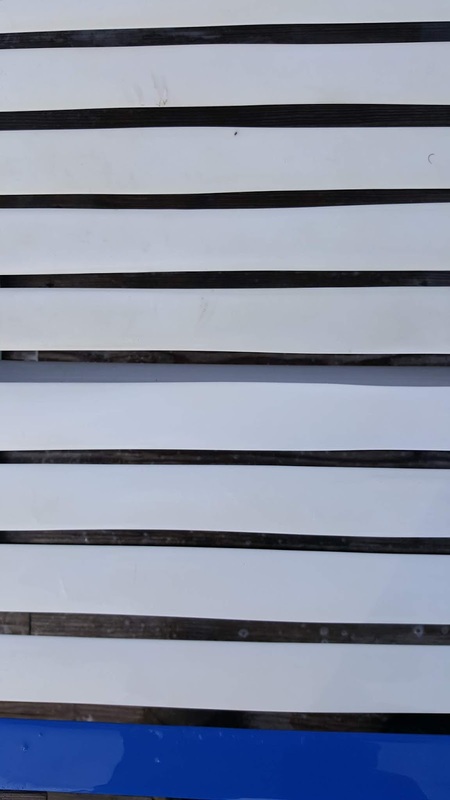 Canada buys a lot of cardboard from the U.S., but when it comes to glass and plastic very little, and I mean a shockingly small percentage, of glass and plastic is actually "recycled" in this country. I think we have become accustomed to seeing the recycling bins everywhere, and it makes us feel good to put our plastic water bottle, or aluminum can in one thinking we are doing something positive for our environment......in actuality "recycling" is probably causing more harm than good in this country. And then you have the "returnables"......we collect them and then get money back for having done that, but all of those bottles and cans still end up going into a landfill somewhere, or chopped up and dumped in the ocean......I am not exaggerating. Once we had processed the "returnables" and "recyclables" we turned to the daily trash collection and then transport to the local transfer station. We deliver our load of effluent and are on our way back to SDC by 10:45 am......time for lunch! I enjoy how each work day is neatly compartmentalized......if you are on pool duty you clean the pool from 7-8 am. We take a coffee break after that.....I mostly come in at 8 am.....just in time for coffee. Then we clean sites for a while transitioning to effluent collection around 9:45 am, which takes about an hour....sometimes more. Then we take lunch for an hour. We clean restrooms from 12 pm to 2 pm, and then for most employees it is only one hour until quitting time. We'll spend that hour picking up random trash here and there, picking up and returning all the 'toys' to the toy box in the playground. It makes the time go by much more quickly. Then at 3 pm I am on my own for my final two hours to wash and detail our golf carts, wash the company truck, or trim grass and weeds to my heart's content. Before I know it 4:30 has arrived and it is time to put everything away for another day.....I hang my golf cart key in the appropriate place in the 'garage' and head down to the office to chat with TLE for a few minutes before I put an exclamation point on the day with another time stamp on my time card. TLE had prepared anchovy pizza for my dining pleasure both at lunch and for dinner (she works 2 pm to 10 pm on Mondays) so I got out the cold pizza and an even colder Allagash Belgium White Ale to chase it......Allagash Brewing is out of Portland, ME.....this is probably the finest Belgium White Ale I have ever had....I wish I could get this beer on the west coast! TLE was home by 10:15 pm and we proceeded to watch another couple of episodes of 'Comedians In Cars Getting Coffee' before heading off to slumberland......life is good! 6:06 am - Monday - July 30th - Southwest Harbor, ME - 60º F, 94% humidity, wind 1 mph out of the northeast......sunny today with a forecast high of 76º F once again. Slept with the windows open for the first time in a week as humidity has finally fallen significantly! I didn't get to sleep until midnight last night.....read on to find out why. After a really hard work day Saturday, Sunday was a blessing. The complete opposite. We had 36 sites to clean on Saturday, but only 23 on Sunday. First up, though, was pool duty. I was at the pool just before 7 am to find Tammy and Alex just walking over from the office. We did our normal stuff, but on this morning we were also tasked with cleaning all the lounge chairs. After half a summer of suntan lotions and oils they were getting a little grimy so we attacked them with 'Scrubbing Bubbles' cleaner and Magic Erasers. I attempted to take a picture to show the contrast between the clean area and the grimy area, but I can't really see the contrast in this picture.....can you? It was much more obvious in person. From there we gathered up 24 bundles of wood to restock the woodbox, and then it was off to begin cleaning sites......unlike Saturday when people began leaving the night before, Sunday those departing took their time and we were not able to get as many cleaned by lunch as Saturday. Since we couldn't clean many sites we turned to the daily trash collection ritual and then it was time for lunch. After lunch Alex and I cleaned restrooms while Tammy finished the last 7 sites. She joined us in cleaning the men's restroom at 1 pm, and we finished about 15 minutes to 2 pm. By 3 pm Tammy and Alex were on their way home, and I had one more hour. I spent about 40 minutes with my Stihl string trimmer cleaning up a couple of RV sites, and then around the office parking lot. By that time it was 3:40 and time to put away my trimmer, clean my cart and then insert my time card in the 'time machine' to get my final time stamp of another day. The sun is now setting at 8 pm so we are closing the pool then, instead of at 8:30 pm as we have the whole summer. As a result I am now arriving at the pool to begin my night manager duties at 7:30 pm to give the bathers 30 minutes notice. Everything went smoothly, and by 8 pm I was making my rounds of the park and home in my recliner by 8:30. About 9:30 pm I received a call from TLE at the office (she has the 2 pm to 10 pm shift on Sundays) advising that an arriving customer was not getting power in site # 21 so I retrieved my golf cart key and drove down there with my circuit tester. It revealed that there was an 'open neutral' in the 20 amp plug. There was also a 30 amp plug which was working properly so I drove back to the Newell to retrieve my 30 amp to 20 amp adapter for them to use overnight until we can fix the 20 amp receptacle. They were very grateful, to say the least. This is the first time this summer we have had any electrical issues......quite a contrast to TVC where we had multiple daily issues with the electrical wiring, outlets, and breakers. By the time I got home it was almost 10 pm so I waited up for TLE to come home, and then still wasn't sleepy so I stayed up to 11 pm before I finally went to bed.....just as I was about to drop off I began to become aware of music and loud talking coming in my open window, so I get dressed again and walk down to site # 103, which is right behind us, to remind the folks there that 'quiet hour' began at 10 pm.....they apologized, turned off their music, and I was once again on my way home. I think I finally fell asleep by midnight.....am I ever going to pay for that Monday! 5:08 am - Sunday - July 29th - Southwest Harbor, ME - 63º F, 100% humidity, wind 1 mph out of the southwest.....cloudy with a forecast high of 76º F.
We have now, officially, reached the half way point of our summer.....12 weeks down, 12 weeks to go. Within days it will be August and we'll begin to wonder where the summer went. It's time to assess our decision to come to Maine to work the summer. 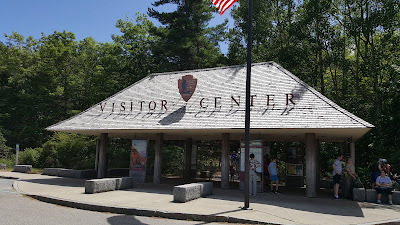 We began to think about coming to Maine last July shortly after arriving in Yellowstone. Since we were not going back to TVC to work anymore we decided Maine would be a good summer 2018 destination. We had never been to New England, let alone Maine and the only time to go there is in the summer.....unless you like winter sports. I joined Workamper.com and began to search their 'Hotline Jobs', as well as back issues of their online magazine. There is also a Facebook group called 'Workamping for Full Time RVers'. Near the end of August, 2017 I came across a 'Hotline' ad for Smuggler's Den. I checked their website and found they were near Bar Harbor and Acadia National Park. I showed TLE the ad and she told me to send our resumes and see what happened. I did so, and within a week we heard from Rain Holbrook via e-mail that she and her aunt would like to do a phone interview the next day when we were available. I replied with a time and received a call from her at that exact time the next day. We talked for almost an hour with TLE and I doing as much interviewing as they were. By the end of the interview we decided to accept their offer, and within an hour or so Rain had emailed an employment contract for us to review and then complete if we wished to proceed. By the next day we had completed and signed the contract, and emailed it back to them. They wanted us to be on site by May 12th, and we agreed. Over the course of the Fall and Winter Rain stayed in contact, and we continued to ask questions and get prompt replies. 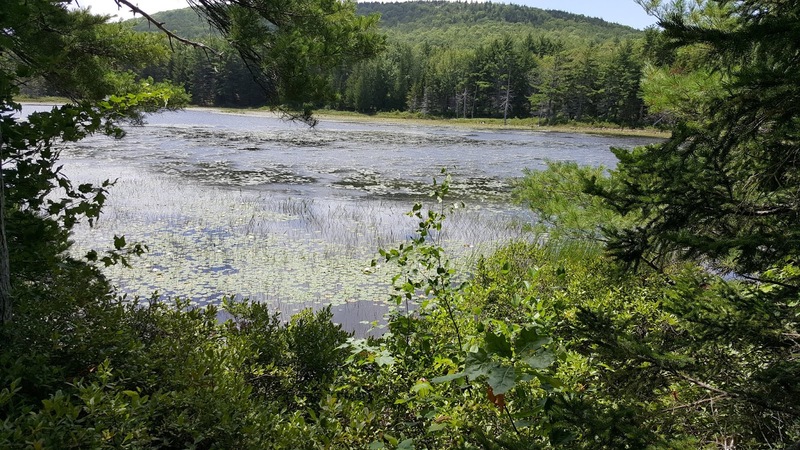 We were impressed and pleased with the communication, and looked forward to our one month trip to the northeast, and then 5.5 months in Maine. Between Yellowstone and Maine there was the job at the Grand Canyon where I had my stroke and recovery. 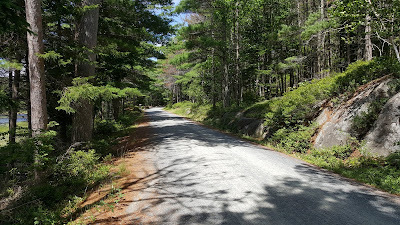 There was a time when we thought it might be wise not to go all the way to Maine, but my recovery was quick and by the first of April it was a distant memory. As you will recall I had the bicycle crash about 10 days before our departure, and was lucky there were no broken bones as that most likely would have derailed us from going to Maine, but I just had some bad bruises so our trip was still on. 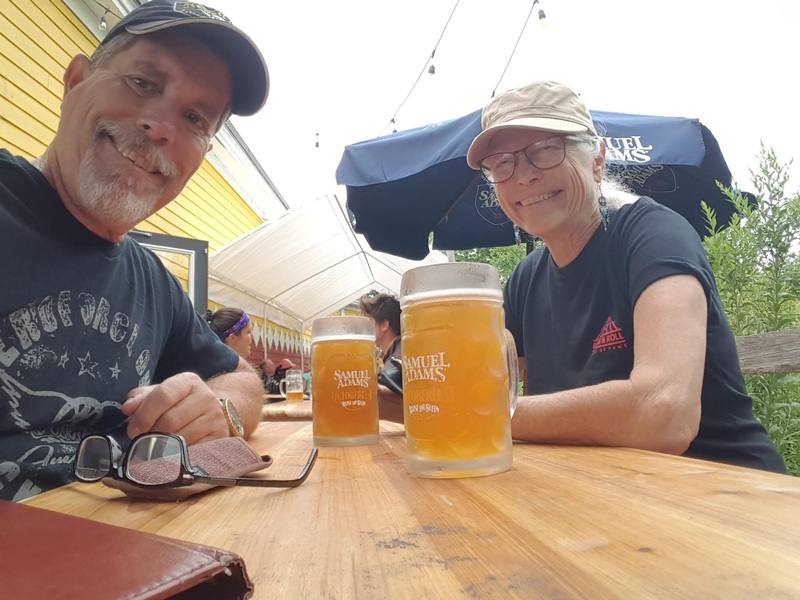 We departed Fontana on April 17th....a few days later than we had planned to give me more time to recover from my bicycle accident. I was still quite sore, but was able to drive the Newell with no issues. 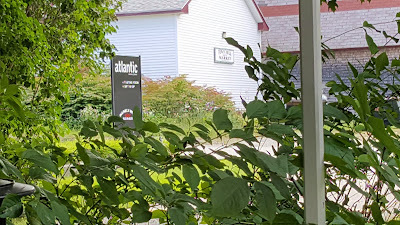 After a wonderful 4 week journey we arrived safe and sound in Southwest Harbor, ME.....our home for the next 5.5 months. As with all jobs it took me about a week to acclimate to my new job and responsibilities. I hadn't done physical work outside for almost a year when we arrived at SDC, and it took me a good month to build up my endurance to where I wasn't exhausted at the end of every day. As I write today's missive I am still quite tired at the end of each work day, but it is a pleasant 'tired'. There were times during that first month when I wondered how I would ever work a full 8 hour workday, but here I am doing just that and doing just fine. Would we do anything different? Yes, we would not agree to work 5 days per week. If we had it to do over we would only work 4 days per week, but we agreed to work 5 days and we keep our word. If we were ever to return we would only work 4 days per week, and 7 hour work days like pretty much everyone else here (except for the owners). The weather has been wonderful, and better than we expected. The bugs were a small issue early in the summer, but now are mostly an afterthought. I get the odd mosquito bite from time to time, and as long as I keep my distance from yellow jacket nests I don't have to worry about them. The black flies were an issue the first two weeks, but I only got bitten a few times, and have had none since early June. We really like our RV site, and wouldn't change a thing about it. We are looking forward to our time after Labor Day (as we did in Yellowstone) when the crowds will once again dissipate, and the weather will cool making it more enjoyable to hike and go site seeing. We have talked about returning to Smuggler's Den in the next few years, but we'll see. Right now I am looking forward to no job in the summer of 2019 and seeing Alaska! 6:16 am - Saturday - July 28th - Southwest Harbor, ME - 64º F, 97% humidity, wind 2 mph out of the south......overcast with a forecast high of 72º F.
Friday began with a heavy mist invading SDC. The humidity was high, as one might imagine. It wasn't raining as I was walking to the 'garage' to pick up a golf cart, but I was getting wet.....you could feel the moisture in the air. It remained cloudy, and misty most of the morning, but as we returned from lunch the sun began to make its first appearance in days. When the sun comes out again after a long absence all the moisture in the ground resulting form the heavy mists, dew and rain begins to return to the air whence it came and that increases the humidity exponentially. I spent the rest of the day feeling sightly damp, but I know this is a necessary process. If we can get a couple of days of sun the water in the ground will evaporate, the humidity will gradually decrease, and things will get back to normal. We haven't had our windows open in at least 5 days.....I would like to have them open, but then my last refuge from the humidity would disappear. 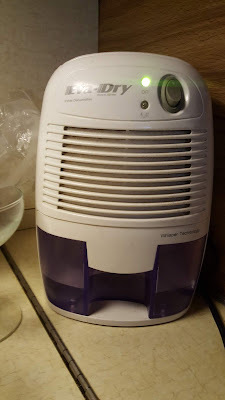 Our little dehumidifier is doing a wonderful job keeping the humidity inside our Newell at a comfortable level.....when it gets warm, as it did yesterday afternoon, we just turn on the A/C for a while to cool it down and further lower the humidity. Friday at work was no different from any other Friday, or another other work day for that matter.......we restocked the woodbox, cleaned sites, deadheaded flowers, gathered trash, cleaned restrooms, and I finished my day as I always do (except on rainy days and Hawaiian Night) trimming weeds and grass with my Stihl string trimmer. About 4:30 pm I called it a day and pointed my golf cart toward the 'garage'......I unloaded my equipment, and washed the grime from another work day off the company golf cart. TLE had made a casserole for our dinner Friday night and left instructions for me to put it in the oven at 5:45 pm so it would be done by the time she arrived home. I took a long cool shower and was relaxing in my recliner when The Lovely Elaine arrived home from her workday. There, of course, was more watching of 'Comedians In Cars Getting Coffee'.....of course. Life is good.....thanks for stopping by! 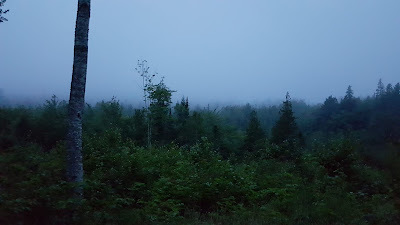 6:11 am - Friday - July 27th - Southwest Harbor, ME - 64º F, 100% humidity (once again), wind 1 mph out of the north by northwest......cloudy, foggy, muggy with a forecast high of 74º F.
For the first time since I was issued my 'foul weather gear' I wore both the jacket and the pants, as well as my rubber boots to work. I walked over to the garage to pick up a golf cart and drove to work in a driving rain storm......not exactly how one might wish to begin their day. But, as Todd often says, we work rain, or shine.....and that we did. The wood must be restocked, the sites must be cleaned, the trash must be collected and the restrooms must be cleaned. Friday was not the first work day which has begun with rain, but it is the first time it rained this hard for this long, nonetheless, I am getting used to it, and it really doesn't bother me that much anymore. Fortunately the 'foul weather gear' is very effective and keeps us all quite dry except for our hands and faces. It was never really cold.....just wet. After collecting 14 bundles of wood for our wood box we (Steven and I) helped Tammy clean sites until about 9:50 am when we turned our attention to the ubiquitous trash.....time to collect it all! We had it all collected by 10:30 an were off to the transfer station to make our daily donation. By the time we returned it was about 10:50 am and almost time for lunch. We parked the truck, picked up our golf cart and proceeded down to the office to clock out. TLE had left a pulled pork sandwich in the fridge for me made out of the leftovers from her lunch at Mainely Meat the other day.....delicious! 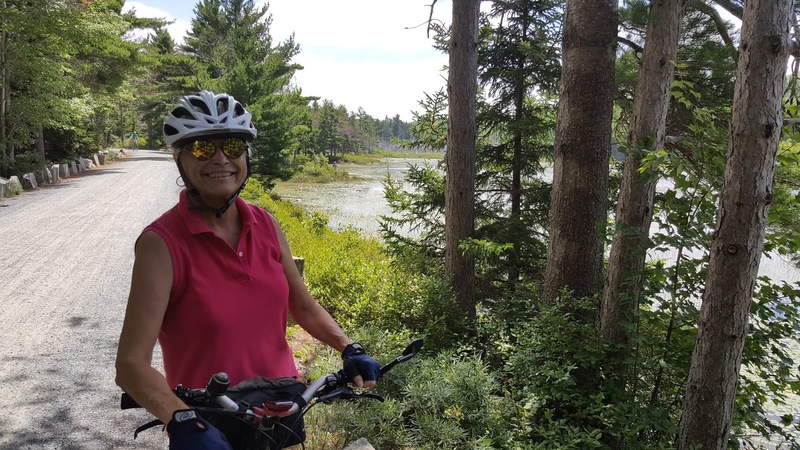 By the time we returned from lunch Tammy had finished the last of the 15 sites on the departure list, so she joined us in our daily cleaning of the restrooms. With all the rain they were a mess, and it was helpful to have a 3rd person. We finished them on time, and now it was 2 pm. Steven went home at 2 pm, and Tammy at 3 pm. Steven and I had not processed the returnables, and recyclables during our trash run, so I turned my attention to that. I collected five 70 gallon trash bags full of these items, and delivered them to our recycling station up by the 'garage'. There is quite a pile of bags there now, so I'm sure they will be loaded into the company trailer and hauled to the sorting center soon. The rain had quit while we cleaned the bathrooms, but it was still too wet to do any string trimming, so I spent time sweeping out the 'garage', washing the golf carts, and picking up the 'toys' (basketballs, baseballs, bats, badminton rackets, birdies, volleyballs, etc.) around the playground, basketball, volleyball and badminton courts returning them to the large Rubbermaid toy box we keep in the playground area for just this purpose. By this time it was almost 5 pm and time to end another work day at SDC......the office had been quite dead most of the afternoon, so TLE left Sam to man the office for the rest of the night and came home with me an hour early. We had bought some chicken kabobs the day prior at Hannaford's in Ellsworth so I turned on the Sea-B-Que and grilled them. TLE prepared a side salad, and some rice to accompany them.....outstanding! We watched more episodes of 'Comedians In Cars Getting Coffee' laughing until we cried. We loved the episode featuring Larry David (he and Jerry produced the sitcom 'Seinfeld' for 9 years).....he and Jerry Seinfeld were hilarious together. I love laughing before I go to bed. It kind of clears my head and makes it easy for me to fall asleep. 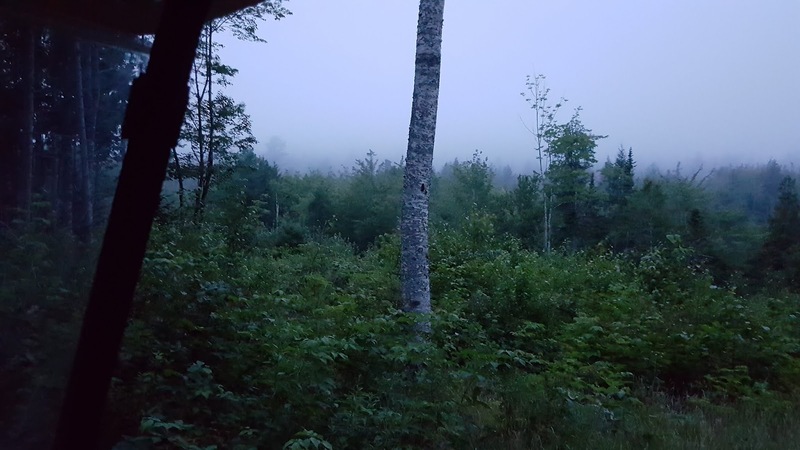 5:50 am - Thursday - July 26th - Southwest Harbor, ME - 65º F, 100% humidity, wind 15 mph out of the south......raining heavily since 2:30 am.....heavy cloud cover......very, very humid.....forecast for today includes a high of 69º F and rain until early afternoon. ......we got this little RV dehumidifier in Louisiana our first year on the road. It really does a good job.....you can see here that just overnight the little water collector is 1/3 full. When it is humid, just as it is now, we leave it on 24/7 and keep the windows closed. It really dries out the air! 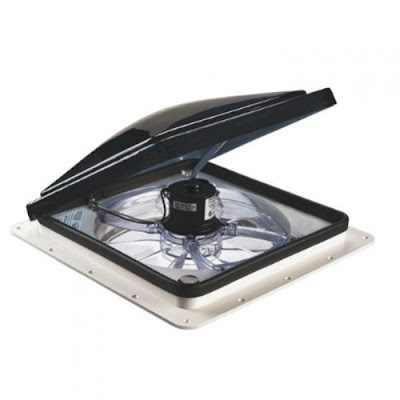 If it also happens to be warm, or hot we run the A/C to help dry the air, and keep it cool. ......while TLE busied herself with a pedicure, I wandered through the local Goodwill looking for something without which life would no longer be possible.....nothing caught my attention, so no life altering decisions had to be made. I got a text from TLE giving me the 15 minute warning that she was almost done with her pedicure, so I drove back to the shopping center to await her appearance. From there we walked over to a local outlet store called Reny's. 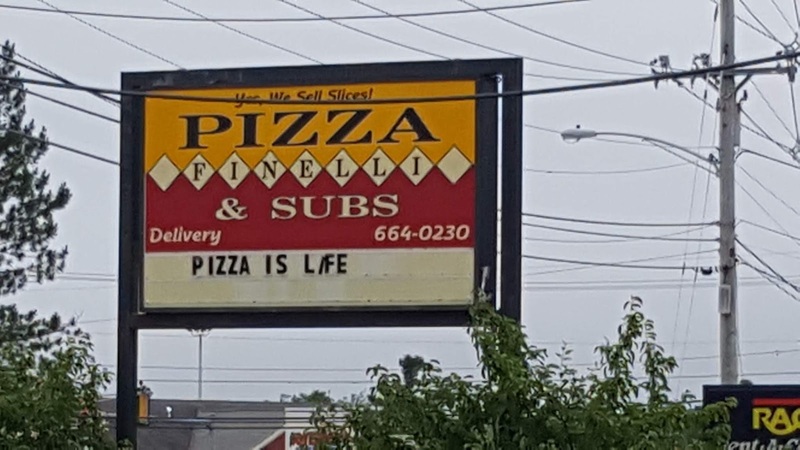 They are a local Maine franchise and have about 12 stores. They carry a lot of higher end merchandise by Carhartt, Columbia, Keen, Timberline, Under Armor, HiTech, and many others. I bought some shoelaces, but that was it. I'm sure we'll being paying Reny's a visit in the future. Next up was a 'big' shopping at Hannaford's Supermarket where we filled a shopping cart....by this time it was around 2:30 pm and we had not eaten lunch yet, so we found a local pizzeria called Finelli Pizza and Subs (rated at 4 stars by Yelp on over 90 review.....note to self......Yelp is not always right). They have a very informal ordering and payment system. You order what you want, they bring it to you, and after you are done you go to the cash register and tell the cashier what you got.....it's all on the honor system. 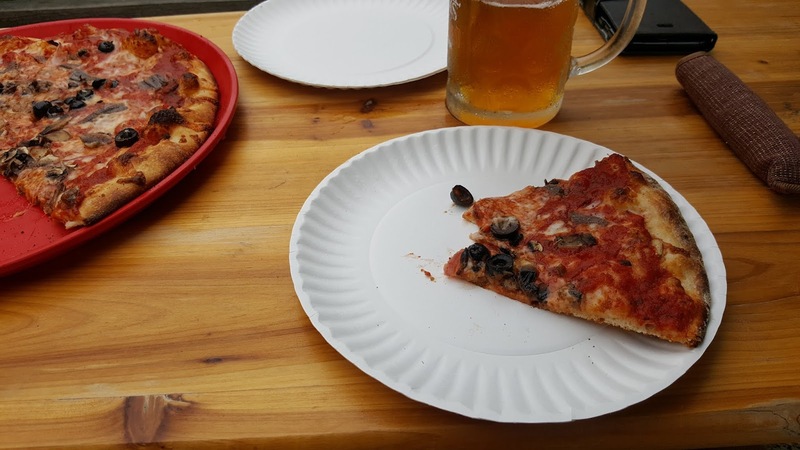 ......the toppings we ordered seemed to an afterthought, however, the crust was good. We returned home by 4:30 pm to find the interior of the Newell a little warm, so we /turned on the A/C for about an hour to lower the temperature and help our dehumidifier dry the air. After that it was fine. We watched some more 'Comedians In Cars Getting Coffee' until 9 pm when I went to bed. TLE goes to work at 10 am on Thursdays so she stayed up reading for another hour, or two. About 2:30 am the rains came and continue as I write today's missive....work will be 'fun'. 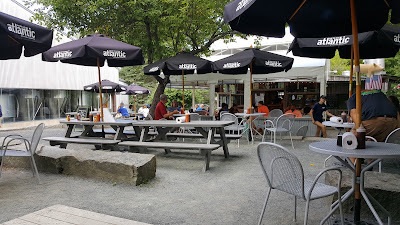 8:41 am - Wednesday - July 25th - Southwest Harbor, ME - 66º F, 100% humidity, wind 10 mph out of the south......cloudy with occasional rain.....forecast high for today is 69º F......wow! At 8:41 am we are only 3 degrees away from the high for today! 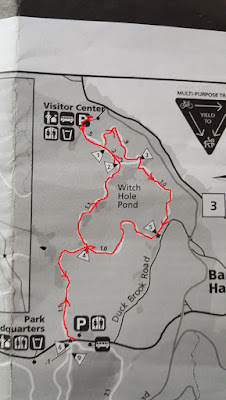 We try to get out and do either a hike, or a bike ride on at least one of our days off work, and Tuesday TLE decided we should ride the 'Witch Hole Pond' ride on the Carriage Roads. 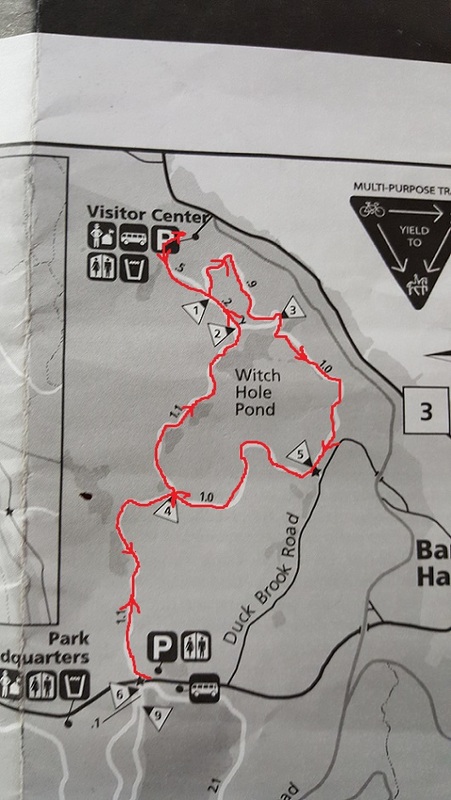 Most of the rides begin and end at the Eagle Lake Trailhead. 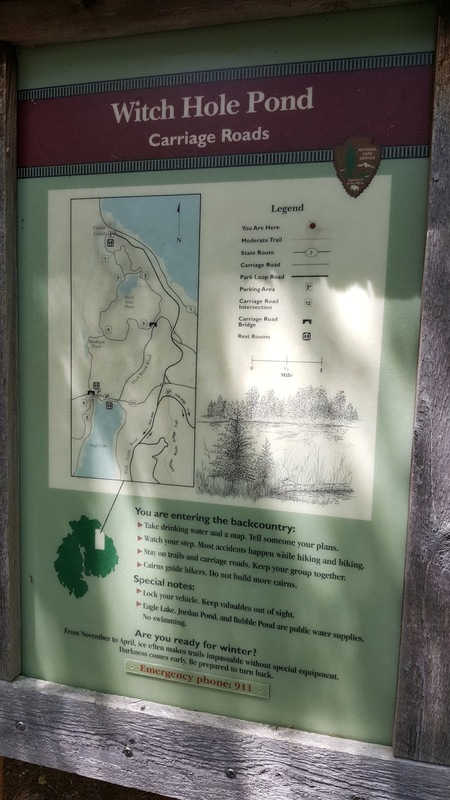 There are many other trailheads, but Eagle Lake is right smack dab in the middle of the carriage road complex, and we are always able to find parking quickly. Before we went anywhere, though, there was the 16th stage of the Tour de France to watch. The televised coverage usually begins at 8 am eastern time, and we are usually up sometime after 8 am on Tuesdays, so watching it wire to wire really fits our schedule perfectly. It was finished by 12:30 pm, and we were on our way over to Eagle Lake in the VW a little after that. Now to ride back up the road! .......our next destination was the Atlantic Brewing store in lovely Village of Townhill, just off the road to Ellsworth. 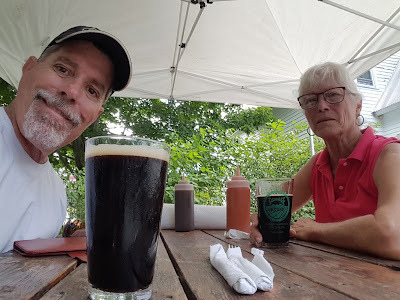 We were there before 2:30 pm ordering a couple of Ellen's Coffee Stouts, and browsing the menu for the restaurant attached to the brewery.....Mainely Meats, which specialize in BBQ.......we ended up ordering their 'Sampler' which had all their sides, and BBQ offerings......delicious! The 'Sampler' plate was a lot of food, which I managed to eat, but TLE ended up bringing home about half her plate. The BBQ wasn't the best I have ever had, but it was very good. The brews were perfect! After about an hour we headed for home arriving just after 3:30 pm. ......thank for stopping by.....really....thank you! 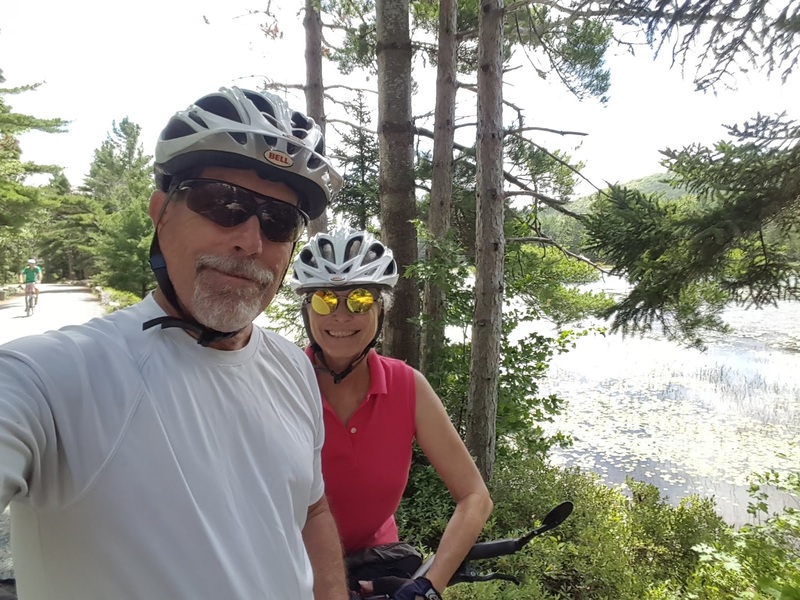 8:50 am - Tuesday - July 24th - Southwest Harbor, ME - 65º F, 100% humidity, 6 mph out of south......heavy cloud cover with a forecast high of 70º F. Taking a bike ride later today. I enjoy Mondays with Tony.....he is funny, he is irreverent, he makes me laugh, he doesn't care what anyone thinks about him.....he always says exactly what is on his mind. On this Monday it was just the two of us for most of the day doing the important outdoor work at SDC. One and a half armed Alex had a doctor's appointment in Ellsworth to see if he can become 2 armed Alex once again, and would not be at work until early afternoon. Normally Alex would be doing most of the site cleaning, and all of the flower care on Monday, but because of his absence that fell to Tony and I, so after retrieving 32 bundles of wood to refill our beloved wood box we picked up the site cleaning equipment and proceeded to do just that. How many sites one can clean prior to the 11 am lunch break really depends on how many of our customers choose to depart prior to that time. 11 am is the checkout time, and as one might imagine, a certain percentage will always push their departure right up to 11 am, which is fine, but if a large percentage choose to depart right at 11 am it puts a crimp in our site cleaning. On this Monday it appeared many of our departures were in the 'leave at 11 am' category. Another thing Alex does on Mondays is take care of all the flowers, so we had to work that into our routine as well. Nonetheless, no matter what task we may find ourselves doing we (Tony and I) must break away to make the daily trash pickup and run over to the transfer station by 10 am at the latest. By 10 am we had only 3 sites left to clean, and it was time to change hats and become refuse technicians. Normally we will fill up the truck bed with trash bags, but on this particular Monday we had a grand total of 10, or 11 bags of garbage to offer up to the transfer station gods. We were back at SDC at 10:55 am and 'clocking out' for lunch......Tony lives about 3 miles from SDC and usually goes home for lunch, which he did on this day. I took the cart up the hill to the Newell to find TLE making me a wonderful grilled cheese sandwich for lunch. One thing about Sundays and Mondays is that TLE works the 2 pm to 10 pm shift, so is always home making me some kind of lunch involving the induction burner, which means hot food, which I love, but the downside is she doesn't come home until after 10 pm. Whilst eating my aforementioned wonderful, hot grilled cheese sandwich I remembered Tony and I had forgotten to do 'site checks' before retiring for the lunch hour, so I cut my lunch break short by 15 minutes to get them done before noon. By the time I finished site checks it was noon, and time for the daily bathroom cleaning ritual. Tony was already taking care of the trash and replacing paper towels, and TP when I arrived. Normally it falls to me to do the water work in the bathroom, but Tony likes to spray the soap, rinse everything down, and then apply the disinfectant, and I am happy to defer to him one day a week. The other big job, which comes first, is the vacuuming of the restroom floor, which takes about 10-12 minutes, and then it is time for Tony to take over. On this day the floors were quite dirty, so it took me about 15 minutes to complete the vacuuming phase. Nevertheless, we still finished cleaning the women's side in about 35 minutes. We had about 25 minutes before we could close the men's side, so Todd asked us to help him replace a full size refrigerator in cabin # 308. It actually took us until about 12:15 to do that, so we got a late start on cleaning the men's side, but still managed to finish at 1:50 pm. While we were occupied with the men's restroom Alex returned and commenced to clean the last three sites. Tony goes home at 2 pm, so I bid him adieu and went to work with Alex to finish the daily flower care. Each summer SDC hosts 'Hawaiian Night', and this Monday was that day. After finishing with the flower care we began to haul all the Hawaiian props (tiki lamps, tiki god, leis, tables, and other assorted decorations) down to the the area by the live music stage. We were done about 4:40 pm, so I went home and showered, got dressed in my finest Hawaiian shirt and headed back down for the 5 pm start. .......included in the festivities are separate hula hoop contests for children, and then adults, and that is what is going on here in the above picture followed up with a 'limbo' contest. Our co-worker, Steven Scott, was the emcee on this night for the 15th consecutive year. A great time was had by all, and by 7 pm the festivities were concluded. ......I was home by 8:30 pm relaxing, and looking forward to being off work for two days. I watched the last half of 'Sleepless in Seattle', one of my favorite movies of all time. Nora Ephron is such a great writer! She also wrote 'When Harry Met Sally', and 'You've Got Mail', and I love them all. TLE was home by 10:10 am, and I was in bed by 11 pm......TLE followed a while later......thank you so much for stopping by! P.S. - I do intend to write more about the 11:30 pm call on the night manger phone, and what transpired, but I need more time to think on how to present it so no one is embarrassed. 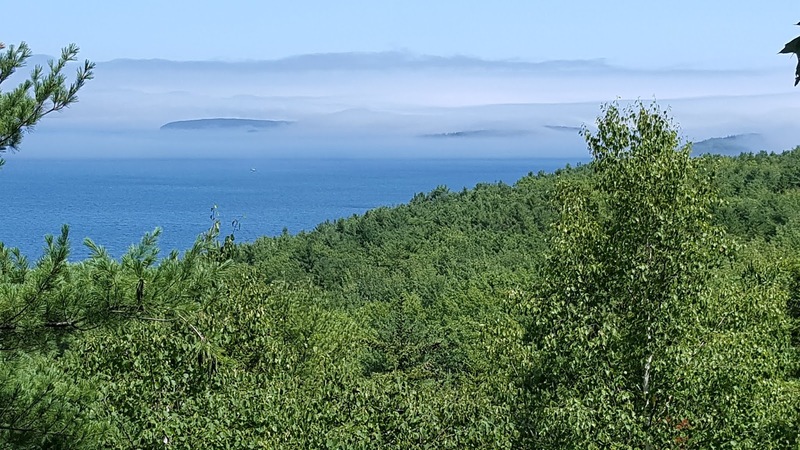 6:09 am - Monday - July 23rd - Southwest Harbor, ME - 64º F, 100% humidity, wind 8 mph out of the east by southeast........cloudy with a forecast high of 69º F.....really? It's only going to get 5º hotter than it is right now? I'm moving a little slowly this morning.....didn't get to sleep until 1:30 am. I am night manager on Sunday and Monday nights, as you know. Since we have been here the only time the night manager phone has rung is when one of the owners was calling me, and that was early in the evening, and only twice, so far. Well, Sunday night about 11:30 pm it rung, and it was a customer in cabin # 304. I didn't get back to bed until almost 12:40 am, and I am beat! However, this is my 'Friday' and I can sleep in tomorrow morning. Sunday was pool day for me which means, of course, I report to work at 7 am, which also means I get off work at 4 pm......if only I could get off at 4 pm and go to work at 8 am.....win, win, right? We began the day with a threat of rain by 10 am.......we had a brief rain squall about 11:30 am, but by the time I went back to work it had stopped and it never rained again. According to the forecast we had a 90% chance of rain most of the day with a total rain accumulation of 3/4 of an inch.....well, not so much......we did get high humidity, however. According to the weather service, we are in for 5 days of high humidity, but not high temps.....nothing but high 60's and low 70's for the next two weeks. Nothing much more to report about Sunday....the only thing different was what I wrote about in my opening paragraph. The call was not about a noise complaint, but I will leave the substance of that call until I publish tomorrow's missive. On the sports front 'The Open' was on this weekend (The British Open). This is one of my favorite opens during the golfing season. As always I was pulling for Tiger Woods to do well, and even win. He was actually the sole leader for two holes on Sunday on the back 9. He ended up with a double bogey on the 11th, and a bogey on the 12th taking him from 7 under par to 4 under par, and that essentially took him out of contention. His playing partner on this day ended up winning at 8 under par, and he (Tiger) finished at 5 under par. For about 30 minutes it was really exciting to think that Tiger might win another major. TLE works until 10 pm on Sunday so I am on my own all evening. I got home a little after 4 pm, changed clothes and just sat down to unwind for a while before taking a long shower. I spent time watching a large portion of Stage 15 of the Tour de France. Hard to believe there are only 6 stages left in this years 147th edition of the Tour de France.....time is moving quickly! On the yellow jacket sting front, the swelling is mostly gone now, but the itching has begun, and based on the first time I got stung it will last 4-5 days. 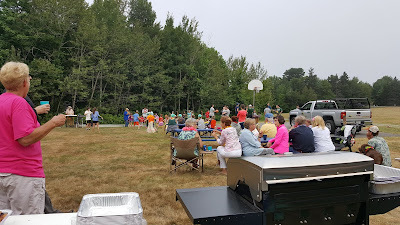 05:14 am - Sunday - July 22nd - Southwest Harbor, ME - 58º F, 95% humidity, wind 5 mph out of the east.......cloudy with 65% chance of rain by 10 am.....forecast high for today is 66º F. Today is pool day....I hate getting up so early! So, I don't recall (I guess I could look at yesterday's blog and recall for sure, but I'm lazy) if I wrote about getting stung on Friday for the second time this summer by a yellow jacket/hornet/wasp. 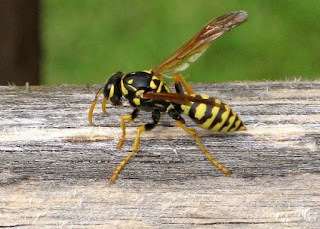 In California we call them yellow jackets, but here in 'down east' Maine they call them wasps, or hornets. Whatever they are called their bites hurt like heck.....comparable to having someone stick an ice pick into your leg. Two, or three weeks ago I was stung on the back of my right leg on the achilles tendon, just above the heal. This time I was stung, or bitten (they do both) on the front of my right leg just above the ankle. The first time I just got a large bump that itched for about 5 days. This time my whole ankle swelled. To combat this, obviously, allergic reaction I took a Benadryl, which has brought the swelling down, but this is not a good sign as I believe this progression is how you become sensitized to their bites, which ultimately could lead, way down the road, to anaphylatic shock. Anyway, I will not be responding to any future requests to exterminate yellow jacket nests. Saturday was another wonderfully delightful weather day. Every Saturday I arrive at the office with a little trepidation as to how many sites will have departures requiring them to be cleaned. The prior two Saturdays had 39, and 31 departures respectfully, and I was expecting something similar this Saturday, but it turned out there were only 26 sites needing cleaning.....whew! After collecting 17 bundles of wood to restock the wood box Alex and I set out to begin cleaning the 26 sites. Fortunately, there had already been several departures and we were able to get right to it staying busy the entire morning and right up to lunch when we finished our 18th site. After lunch Alex and I reconvened finishing up the last 8 sites by 1 pm, and after dumping our firepit ashes, and trash we headed over to the men's restroom to help Steven and Tammy finish cleaning. Once the restrooms were done Alex and I headed to the various recycling stations we have here at SDC bagging up the 'returnables' and dropping them off at the main recycling station here at SDC where they will continue to accumulate until we pack them off to the recycling station for redemption. By the time we finished that task it was almost 3 pm and time for Tammy, Alex and Steven to head home. I, of course, had two more hours and as has been my custom for weeks now I retrieved my Stihl string trimmer and began trimming grass and weeds. There is a never a shortage of trimming to be done, but at least I am keeping up with it by doing some every day. I was home a little after 5 pm taking a much needed shower, and then relaxing outside with an adult beverage and a cigar waiting for TLE's arrival. 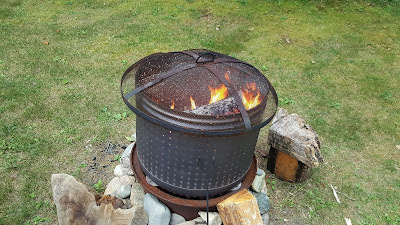 About 10 minutes before she came home I lit the Sea-B-Que so I could grill a couple of filet mignons for dinner. 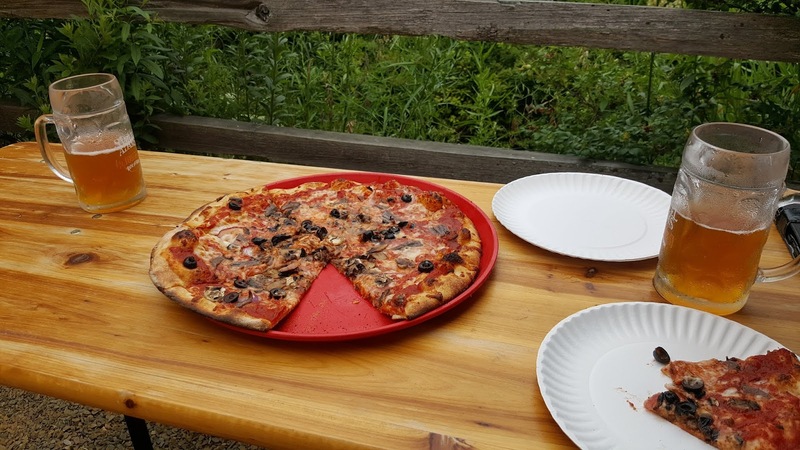 TLE provided a side of roasted vegetables, and we once again ate alfresco. The evenings lately are just so pleasant, and seem to demand they be enjoyed outside, so we are more than happy to acquiesce to that suggestion as long as they last. We watched a few more episodes of 'Comedians in Cars Getting Coffee' before heading off to slumberland once more time. 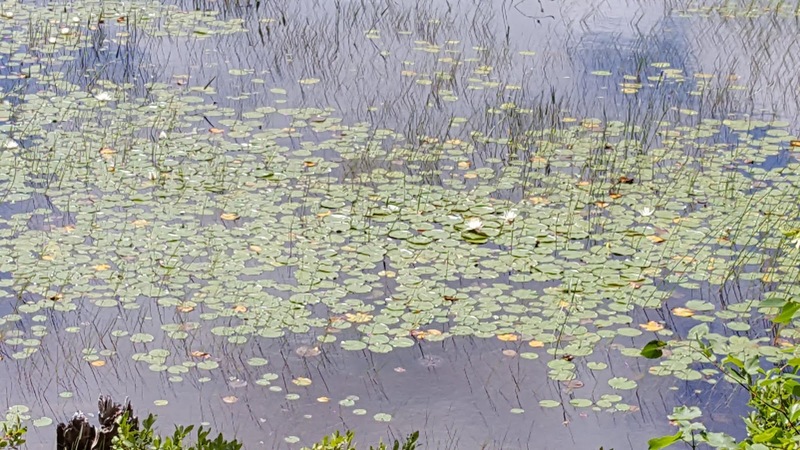 6:09 am - Saturday - July 21st - Southwest Harbor, ME - 54º F, 100% humidity, wind - CALM.....partly cloudy with a forecast high of 71º F. Rain on the way Sunday morning. Friday three of our four groups departed leaving a mountain of large garbage bags at the appropriate garbage station. Their sites were immaculate.....one, or two small pieces of paper, but otherwise spotless. Kudos to them for making our job easier in that regard. We did have to move several picnic tables back to their appropriate spots, but otherwise all was cool. Our weather Friday was perfect with the thermometer peaking out at a comfortable 76º F accompanied by deliciously delightful breezes. As we edge slowly toward and into August it appears that our temperatures will continue to hover in the 70's for the next fortnight.....sweet. Nothing out of the ordinary to report for Friday except our effluent haul to the local transfer station was the largest of the summer so far. We had to drive the truck under 25 mph to keep bags from blowing off the truck.....we were successful. During a period of wakefulness last night I calculated that there are 59 trash cans, and 10 recycling cans to empty every single day. We accomplish that daunting task in anywhere from 30-45 minutes. On Friday we had an additional 10 bags of trash to pick up which did not fit in our 59 cans for a total of almost 70 large 70 gallon trash bags. The other deviation from our normal day was to thoroughly clean the pickup bed and cab interior of the company truck. It was beginning to smell like the transfer station. We accomplished that task shortly after finishing our daily bathroom cleaning duty, and them Tammy and Alex were off work. .......and then headed up to the 'garage' to clean my cart, and drop off my package at the Newell before heading back down to the office to record my time on my time card.....another 8 hours in the books and time to relax. TLE was home by 6 pm at which time we retired outside on the patio to have a cocktail, and for me a cigar. Around 6:30 pm I lit the Sea-B-Que so I could grill up an Ahi steak for dinner. For the first time in a long time we ate our dinner alfresco. We sat talking and eating until after 7:30 before we headed inside for the evening......as I often say....."SWEET". 6:06 am - Friday - July 20th - Southwest Harbor, ME - 54º F, 94% humidity, wind 1 mph out of the north by northwest.....sunny with blue skies and a forecast high of 76º F. I was going to say I slept like a baby, but babies wake up like 6 times a night, right? So, I will instead say I slept like a content adult. The weather Thursday was just spectacular! 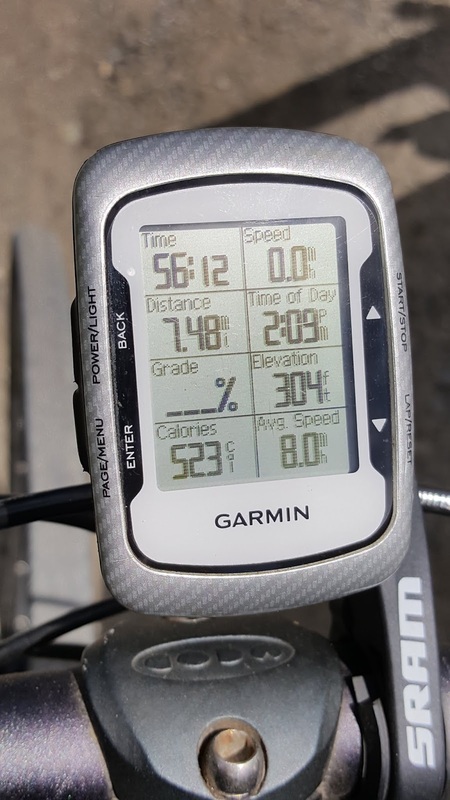 It seemed like it was 70º F all day long. When the weather is that perfect work almost seems incidental. Being outside becomes its own reward, and the hours seemed to fly. As is often the case we spent the morning filling up our wood box with 17 bundles of wood, then helping Tammy clean some of the 15 sites with departures, then switched over about 9:45 am to loading another 24 hours of trash into the company truck for transport to the local transfer station followed by a quick stop at McEachern's Hardware Store to pick up some carriage bolts and super glue for Todd. We were back in the folds of SDC at 11 am.....time for lunch! Again, the afternoon began with our usual two hour stint in the campground restrooms making them clean once again. We were finished with the men's restroom by 1:35 pm and took a break. 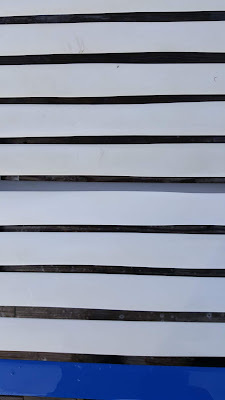 Around 2 pm I headed up to the 'garage' to paint a picnic table which had been repaired that morning by Todd......four of the five planks had to be replaced with new pressure treated ones. It took me about 45 minutes to apply the required two coats of stain, and then I was free to gather up my Stihl string trimmer and head down to one of the unoccupied group areas, site # 210 specifically, and spend the rest of the afternoon trimming the grass. The group sites are quite large and have 6 wood framed gravel pads for tents.......there is no way to get a mower in there so all the grass must be trimmed via a string trimmer. I finished with site # 210 about 4:15 pm and returned my equipment to the 'garage' and then set about giving my golf cart a thorough cleaning. Once I was finished with that I drove down to the office to retrieve the office golf cart to give it a good cleaning. That endeavor brought me hard up against 5 pm, and quitting time. I drove back down to the office to deliver the now clean office golf cart, punch my time card, and pick up my weekly paycheck. TLE would follow me home an hour later. Combined, TLE I net (after taxes) about $850 per week here at SDC, or about $3,400 per month. Not too bad. Our bank account is beginning to swell with the fruit of our hard work this summer. After Thursday we have 14 paydays left in our tour of duty. I grilled some pollo asado for TLE who converted the finished product into street tacos for dinner. As I ate I watched the ending of Stage 12 of the Tour de France which was another mountain stage. 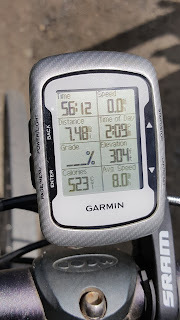 Total distance ridden on Thursday was over 110 miles with much of it involving long, painful climbs. The final climb to the finish line for Thursday was over 10 miles in length and featured gradients of 12% or more in stretches. "Monday I have Friday on my mind......"
"I am not doing anything today!" Oh the humanity.....I mean humidity!